At Sundays Sun Spa Shop, we carry only the best indoor tanning lotions for our members. Devoted Creations never ceases to amaze us when they release something new, and with Black Tulip available at all our salons we know you’re in for an amazing tanning experience. 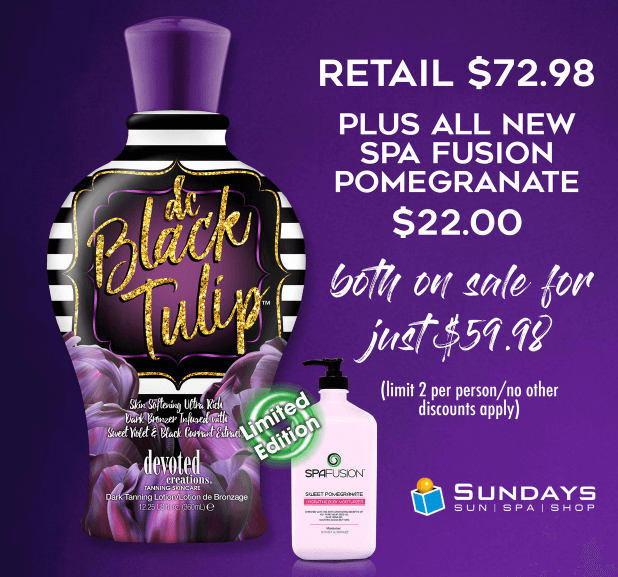 Infused with sweet violet and black current extracts, Black Tulip has a wonderful scent and is rich in Vitamins A and C. Named for one of the rarest flowers in the Netherlands, Black Tulip features dark DHA bronzers for color that lasts, hempseed oil for skin hydration, and antioxidants to help prevent inflammation when you tan. Don’t worry about tattoos, either, because this lotion is designed to protect your ink color. Ask for Black Tulip at any of our locations around Hampton Roads.